Over the next 12 months the 7 start-ups will receive a range of resources, including access to experienced software developers, geospatial expertise from Ordnance Survey, property expertise from HM Land Registry and mentorship on business proposals and investor relationships. They will also receive up to £20,000 in funding. Property-Markets is the people’s property investment market place. Digital-Field provides digital solutions for better land management to improve soil health and food production and reduce environmental impacts. The Future Fox creates software for communities to transform their neighbourhood and for planners to create better places, faster, with artificial intelligence. Watchkeeper International uses the latest geospatial technology, IoT (internet of things) systems and secure cloud services to provide clients with real-time monitoring and alerts for security incidents, natural disasters and supply chain disruptions. 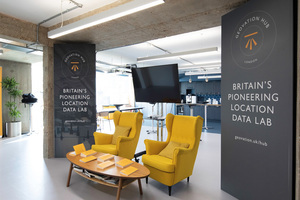 Over the past 12 months PropTech company Hipla has been a member of Geovation’s Accelerator Programme. The company has been receiving assistance to develop a Home Buyer Passport, which aims to improve transparency in the homebuying process. This launches soon. Receiving the backing, guidance and help from HM Land Registry, Geovation and Ordnance Survey has helped our early stage start-up gain a much steadier footing than it otherwise would have done. Their help with early stage funding, office space, data and market insights has been invaluable. Their support has meant we are now in a much better position to deliver on our objectives of improving the homebuying process. Through Geovation we have grown our team significantly and managed to secure pre-seed investment from two amazing investors, Alex Chesterman, the founder of Zoopla, and Simon Franks, founder of Lovefilm. Next for us is scaling up the system and marketing it globally. We are currently finalising a deal with a couple of large engineering enterprises both in the UK and internationally. We offer a founder-friendly environment, great mentors, high-quality workshop content and, almost uniquely, a dedicated software development team in house, who work hand in hand with our companies to build and release their first products. This is something very few accelerators can offer, and it means the businesses joining us can move faster and further than they otherwise would have been able to. We’re very much future focused and are looking forward to meeting and working with the next group of programme members and being a part of their story and them ours. We can’t wait to begin working with them. For further information, examples of businesses, interviews and images contact Keegan Wilson on 02380 055332 or email keegan.wilson@os.uk. Geovation is an Ordnance Survey initiative dedicated to supporting open innovation and collaboration using location and property data. Location is at the heart of many of the most successful digital products and services. Land and property is the foundation of our national economy. The Geovation Accelerator Programme is delivered and funded jointly by Ordnance Survey and HM Land Registry. HM Land Registry safeguards land and property ownership worth in excess of £4 trillion, including around £1 trillion of mortgages. The Land Register contains more than 25 million titles, which show evidence of ownership, for some 86% of the land mass in England and Wales. For further information about HM Land Registry visit www.gov.uk/land-registry. Follow us on Twitter, our blog, LinkedIn and Facebook. Ordnance Survey (OS) is the national mapping agency for Great Britain, and a world-leading geospatial data and technology organisation. As a reliable partner to government, business and citizens across Britain and the world, OS helps its customers in virtually all sectors improve quality of life. OS expertise and data supports efficient public services and infrastructure, new technologies in transport and communications, national security and emergency services and exploring the great outdoors.